The start of the school year means back-to-school shopping is in full swing. Your patrons are heading online, purchasing items from online stores, and making extensive use of virtual catalogs. Bottom line, your patrons are well-versed in the online shopping user experience. "add to cart", and check-out. Cue LibCal's Equipment Booking Add-On Module. First Things First - What's the LibCal Equipment Booking Module? An important component of digital merchandising is visibility. Yes, your library has invested in amazing equipment and resources for lending - but it's all for naught if your users can't find them. How easily is it for your patrons to find your library equipment? Can they browse it on any web-enabled smart device? Can they reserve equipment online and 24/7? If your library has made significant investments in lendable equipment like laptops, tablets, headphones, cameras, tripods, etc. and you want to ensure that this equipment is used, you might want to consider LibCal's Equipment Booking Module! 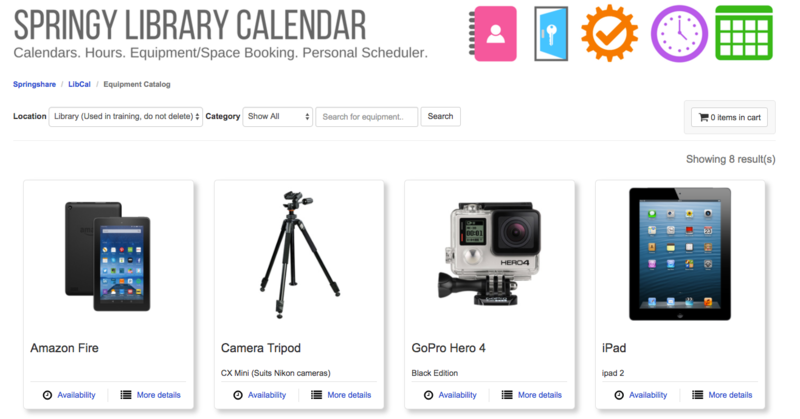 Visually Focused Public Catalog - Tile-based layout makes it easy for patrons to 'shop' your equipment. 'Add to Cart' Check-Out Process - Industry standard check-out process reduces cognitive user load. Flexible Scheduling - Allow some items to circulate for days and others for only hours. Integrated Check In & Check Out of Equipment - Make use of a simple check in / check out process, so you know at a glance which items are available, and which are out with patrons. Sign up for a webinar to learn more - we hope to see you there!